Eaglesham’s Brittany Duvall had a career day on Saturday, setting four Zone records in the Intermediate Women’s category at the 2015 ASAA NW Zone Track and Field Championships at the Legion Track. Duvall set new standards in the 800m (2:33), the 1500m (5:17) and the 3000m (11:21) in the two-day meet. She also teamed up with Kailey Bratland, Taysha Dunnington, and Kelsey Bishop to establish a new mark of 4:34 in the Women’s 4 x 400m relay. Other multiple record setters included Janai Martens from St Joes (Int Women’s Long Jump and Triple Jump), Mark Simpson from Hillside Valleyview (Sr Men’s Shot Put and Discus), Kris Baird from Charles Spencer (Sr Boys Shot Put and Discus), and Madigan Ewan from Hillside Valleyview (Jr Girls Shot Put and Discus). Hillside Valleyview defended its Jr High team title, while High Prairie’s EW Pratt School ended Hillside’s 10 year Sr High team winning streak and took Sr High crown. The top two athletes in each event from the meet qualified for next week’s ASAA High School Provincial Track and Field Championships in Lethbridge. Full results are posted on the NW Zone Track and Field page. 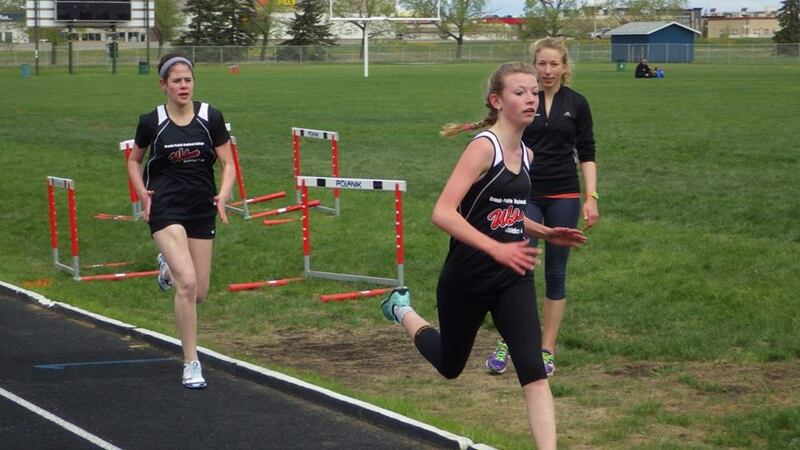 This entry was posted in Outdoor Track and Field and tagged ASAA, Eaglesham School, Grande Prairie, Grande Prairie Alberta, NW Zone Track, Peace Country, Track & Field, Track and Field, Wolves Athletics Club. Bookmark the permalink.